Rose McCoy, a 12-year-old activist, made headlines when she jumped the barricade at the Macy&apos;s Thanksgiving Parade in November to protest the SeaWorld float. Now, she&apos;s planning on speaking out against the amusement park&apos;s treatment of whales at the Rose Parade. "For me, I cannot imagine being separated from my mom to sell tickets to a theme park and being forever captive in a small tank," McCoy tells LAist. "I want every family to know that&apos;s what the whales at SeaWorld have to go through." She flew out from New York to L.A. for the Rose Parade, and along with PETA, will be protesting against the SeaWorld float. A rep from PETA describes the float as depicting "free-living orcas frolicking in the open sea." More people have been protesting SeaWorld since the release of Blackfish, a documentary that takes an in-depth at the treatment of whales held in captivity at the park. The documentary makes the case that orcas are far too intelligent to be held in captivity, and it spurred McCoy into action. "For my whole life, I&apos;ve always been against animals in captivity and Blackfish was more of an educational thing for me about the problems in SeaWorld," she says. "It&apos;s one of the larger problems that I know more about to protest." 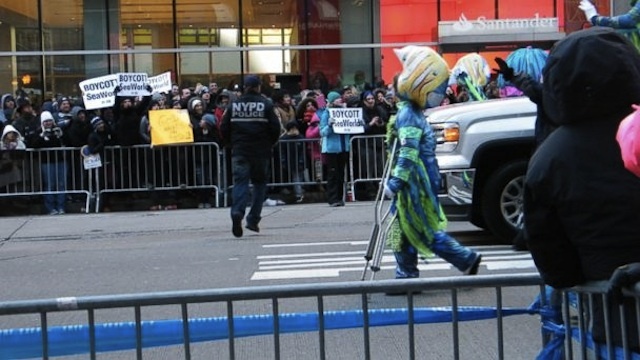 McCoy jumped the barricade at the Macy&apos;s Thanksgiving Parade after she felt the protest PETA planned had fell apart. She stood in front of the line of protesters holding a sign that said, "Boycott SeaWorld," before a police officer brought her back to her mother. “One of the cops said I ruined the parade, which actually made my day,” she told New York Daily News. Her parents have been supportive about her protesting at such a young age, and also protest alongside of their daughter. Although she says some critics have told her it&apos;s too dangerous for someone her age to be protesting, she finds that there are more people supporting her choice.